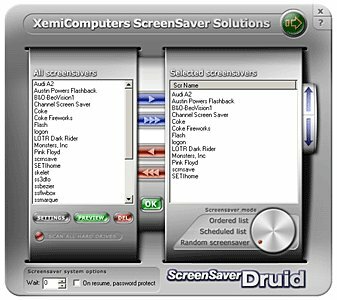 ScreenSaver Druid is freeware solution for managing screensavers. It installs as default screensaver on your computer and has the control center running in the system tray area of your taskbar. Therefore, once you set your preferences for running screensavers in the control center, you can close it down completely and let the screensaver component do its job silently. 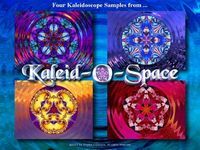 ScreenSaver Druid features ordered, scheduled and random lists for running screensavers. 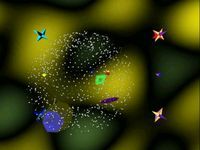 It can go beyond the usual list of screensavers available in the Control Panel and search for all screensavers that might be scattered on your hard drives. Additional functions provided by the program include bringing up screensaver settings dialog, previewing and deleting screensavers. You will also be able to set Wait parameter and enable password protection through options that mirror their counterparts in Control Panel. Double clicking the system tray icon will start a screensaver immediately.